It’s that time of year again where we ditch the boots, scarves, and pullovers and choose the colorful, fun springtime outfits just waiting in your closet. Your “New Year, New Me” resolutions and diets have started to ware off – and in such good timing, because Fresh Beginning’s spring and summer assortments and goodies are right around the corner. Spring is here, which means our favorite Spring holidays are near – don’t have disappointed kiddos or be unprepared this holiday season, use Fresh Beginnings in all of your festive décor, gift giving, and parties this season. EASTER is on April 1st this year (April Fool’s Day & Easter all on the same day… say what!) so make sure you have the cutest Easter baskets, décor, parties, and snacks this year. I am 21 years old, and I still get excited for my Easter basket from my mom every single year. You’re never too old to hunt for eggs, cook your favorite Springtime meals, or dye some eggs. Your kiddos are probably expecting that over-the-top, filled with candy, colorful and yummy Easter basket this April, so don’t disappoint. Get a jump start on your Easter basket fillers and check out Fresh Beginning’s Easter collection! From pastel colored goodies, adorable personalized tins, and more – this year’s collection is the best yet. Skip out on the basic grocery store candy and get your family members something they’ll absolutely LOVE to see in their Easter baskets. A world favorite has to be Fresh Beginning’s jelly beans!!!! The jelly beans are available in gourmet gift bags in two sizes and come with a colorful bow of your choice and sweet customizable message. My personal favorite Easter treat is definitely jelly beans, and my mom never lets me down when it comes to filling my Easter basket with Fresh Beginnings jelly beans. 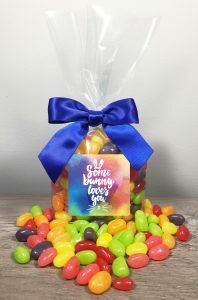 My personal favorite choice for the jelly bean gourmet bag design has to be the “Somebunny Loves You” or the “Easter Bunny Photo” option to add in your own photo to the goodie bag! So sweet and personable! Your family will love the thought that went into their sweet treat! Maybe you’re not feeling the basic Easter basket trend this year, and are looking for something different. All of the adults in your life –your older kids, husbands, parents, grandparents, boyfriends, and work friends will simply adore the Easter custom tins filled with cookies and other yummy sweets. 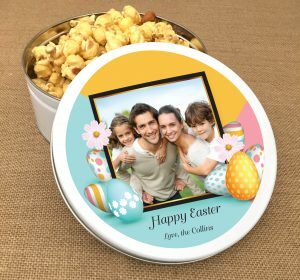 Pick a cute or funny Easter design for the lid, and then add a customizable photo or message to really win them over. The tins include a choice of a wide range of yummy treats like cookies, candied popcorn, jelly beans, candied nuts, and more! There is bound to be something for everyone, and it’ll be impossible to choose your favorite fillers. 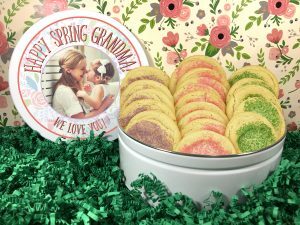 Just picture how thrilled your mother or grandmother would be to open up a surprise package from you on Easter weekend with an adorable custom Fresh Beginnings tin with a cute “Hoppy Easter” design or custom photo. The best present is when you get to eat all the sweets from the inside and cherish the keepsake tin forever. Last but not least to add to your Easter-must-have list is the Fresh Beginning’s Easter Fun Bucket. The perfect way to combine your traditional Easter basket with the Fresh Beginnings goodie tin – the bucket is also customizable but comes packed with more sweets than ever. The buckets are also super versatile – let your kiddo use them as an Easter basket to pick up eggs, store some yummy cookies in it as a cookie jar, or simply save it around as a fun keepsake in your home. My favorite item on the website this season are the pastel sugar cookies. Available in buckets, tins, and goodie bags, these cute cookies will be the hit of your holiday party or your kid’s Easter basket. Coming in a variety of Springtime colors, these cookies will brighten up anyone’s day and surely satisfy their taste buds. Want to SHOP our SPRINGTIME selection?